#glitterroots...it's the newest hair grand to amp up your look. And although it's more of a night look, it's the latest craze around the world. However the trick to achieving this glittery greatness isn’t so much dunking a load of sparkle onto your head and calling it a day. It’s a precise application directly on the roots and spreading the glitter no more than an inch away from the part. 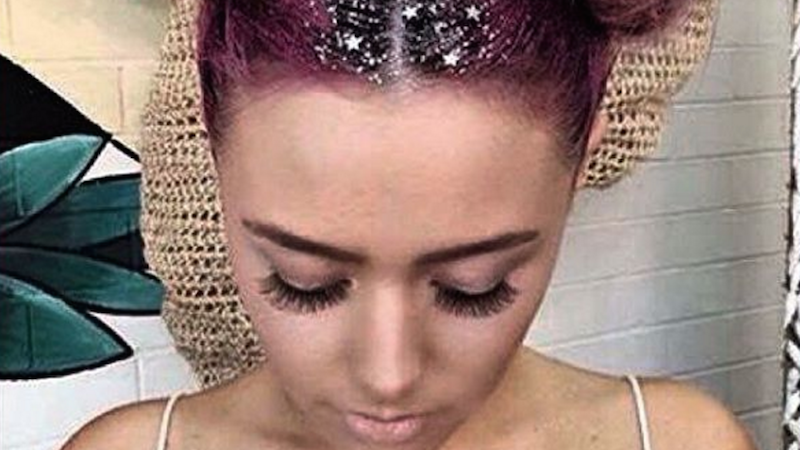 So if you're considering trying this #glitterhair look, mix a chunky style of glitter of your choice (finer particles can be too abrasive on your scalp) with a clear hair gel like to give it some stick. Then, use a small brush to paint on the glitter. Up the sparkle even further by using your fingertips to slowly sprinkle on more glitter in places that feel a little sparse, or add decorative stars or sparkly hearts. If you're wondering how in the hell you will ever get all this glitter out of you're hair: good. You should, because it's obviously impossible. According to some, a paper towel soaked in hair spray can be used, but let's be real. Once glitter gets on your body, it's there to stay.